Here we have the first battalion in the Hanoverian order of battle: FB Osnabrück sometimes referred to the Duke of York's battalion. They fielded 632 men at Waterloo under Major, the Baron Bülow. These are Victrix figures with the Hanoverian metal heads and back packs. They were again assembled by Lord Hill. I will not go into it, but bonding the metal heads to the plastic bodies gave both myself and Martin quite a lot of trouble, and I would not recommend purchasing them. I am sure in their first outing, half of them will end up headless! These were painted in the last week. I have deviated quite a bit from the Perry's uniform scheme as taken from the Mt Jean website. I have instead relied on John Franklin and Siborne, to choose these figures. Again a banner from Flagdude. Yesterday, I really pushed myself and despite working a shift in the ED, I was able to paint and base a command unit as well as an artillery base. Here we have a beautiful figure from the Perry British/Hanoverian Light infantry mounted command pack. 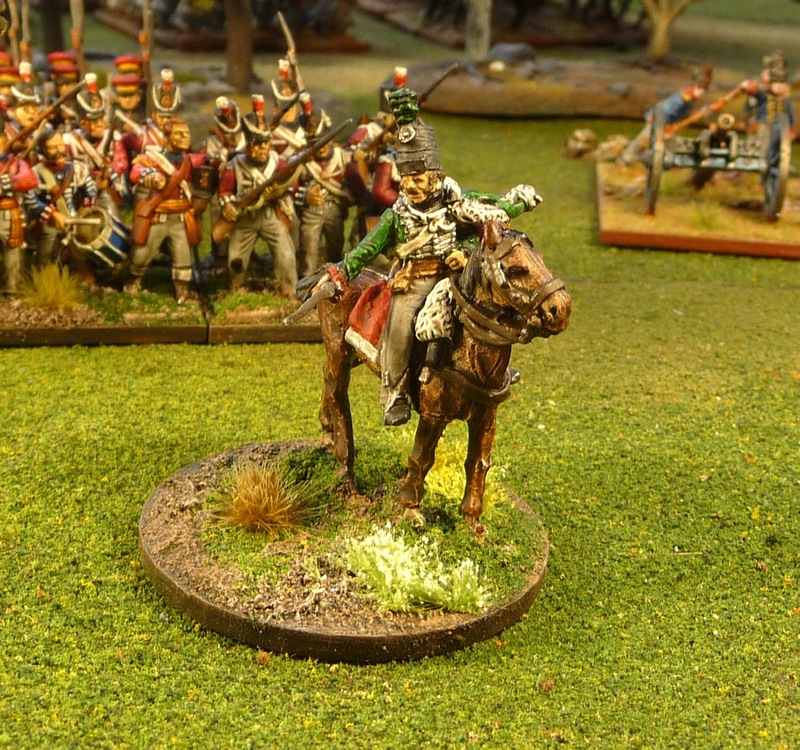 I have chosen this figure to represent Major-General the Count Kielmansegge, officer in charge of the 1st Hanoverian Bde. He ended up commanding the 3rd Division of the Allied-Anglo 1st Corps as both his superior officers; Lt-Gen, the Count von Alten and Col, the Baron von Ompteda were killed or wounded during the battle. After the battle he was put under arrest by Wellington, who misunderstood a communication from von Alten. In fact, Kielmansegge actually commanded with great ability and courage as you can read all about here. Of course, I am sure the uniform is all wrong here, but I always recall Kielmansegge's Jagers so I decided to go with a light infantry officer's uniform. You can see that he is off centre of the base and I plan to add a figure here once I find an appropriate standard bearer as I have a banner for Kielmansegge's Jaeger unit. Last up is a KGL Howitizer base, to add to my 2 six pounders. Again Perry figures. 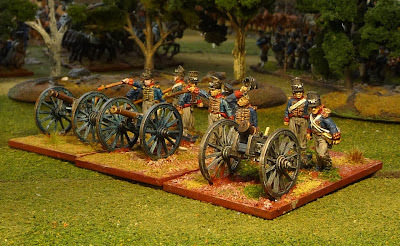 This 3 base unit represents a KGLFA battery under Captain Cleves. 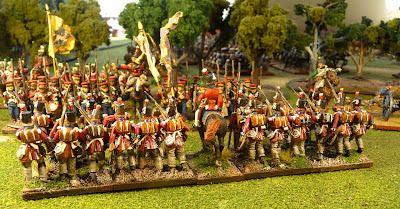 From looking at it now, I believe I used the wrong colour on the carriage, must have got confused with the Prussians. So this is what is left. 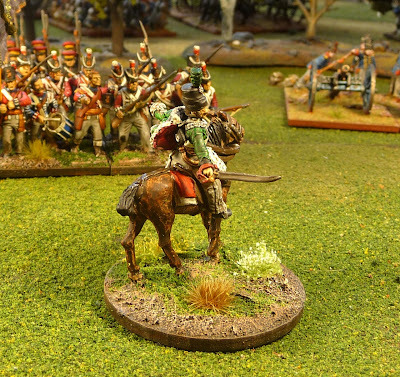 Thirty foot and 2 mounted to complete the two green jackets units left in the brigade. 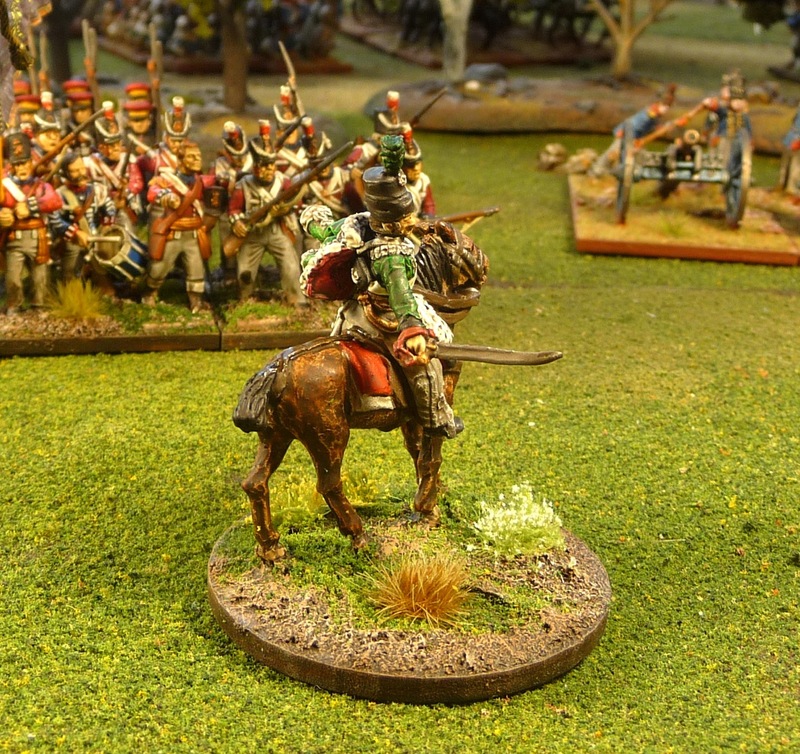 I also have to find 8 rifle-armed jagers as well as a standard bearer. I will probably use Calpe. Well I am off on my hols shortly. A nice two week trip to Italy with my wife. Unlike Curt, I suspect I will not be able to smuggle a traveling soldier paint kit in my luggage. My wife has much in store for me, originally the trip was suppose to be an Austrian alps walking tour in nice 20 degree weather. Now it seems, I will see the Opera in Verona, have a few days in Rome and then off to the Amalfi coast and Capri for a 7 day walking tour along the cliffs in sweltering 32 degree+ weather. I have bought a very jaunty Luc Magnotta type hat to keep the sun off, so lets hope I make it back to blog again. Some beautiful work John, I love the green jacketed Officer stand, even without the other figure. 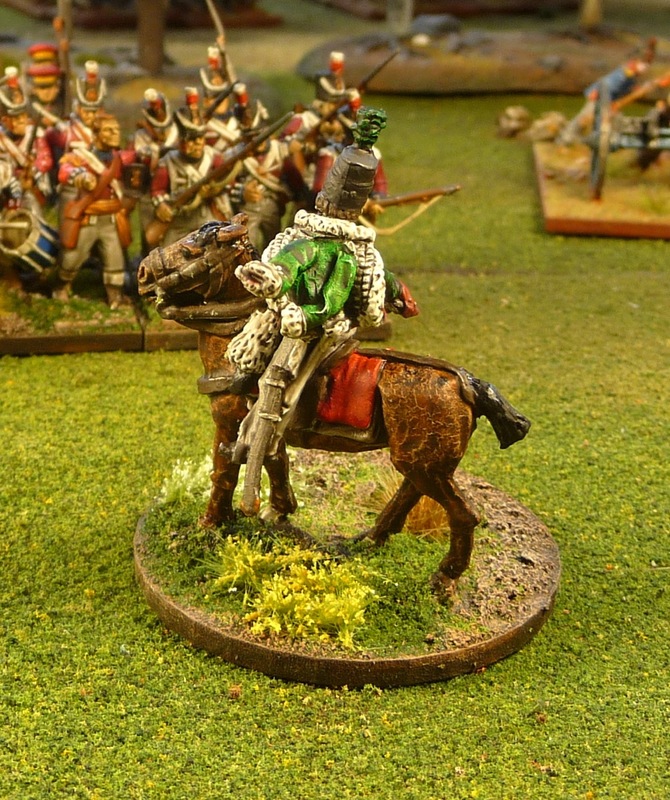 Another batch of great looking miniatures John, especially the mounted officer. Although I'm curious why you had a problem gluing metal to plastic, I won't bother you for the details. 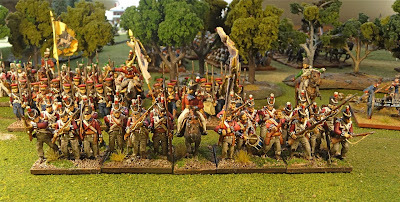 I've allowed my Litko bases order (waiting almost 2 months now) to severely delay my 1813 Prussian project, so I've promised myself to try to do what I can over the 4th without them. Anyway, have an enjoyable and safe trip! Thanks Guys, I am enjoying doing this brigade. Nice and straight forward all different uniforms and colors and only 5 units. Jason, I am not sure if it was me, but I tried multiple superglues, settling on a slow cure. The back packs stuck, but the heads were a challenge. Great output and very nice painting on top of that! Brilliant work, John - and so fast! Awesome. I hope you and your wife have a lovely trip to Italy! We've only been back for a little over a month from our trip to France and we already want to go back... Have a cappuccino and a torta and think of me! Nice looking figures. Regarding gluing metal to plastic, have you tried Weldbond? With a little surface prep I think it would work pretty well. 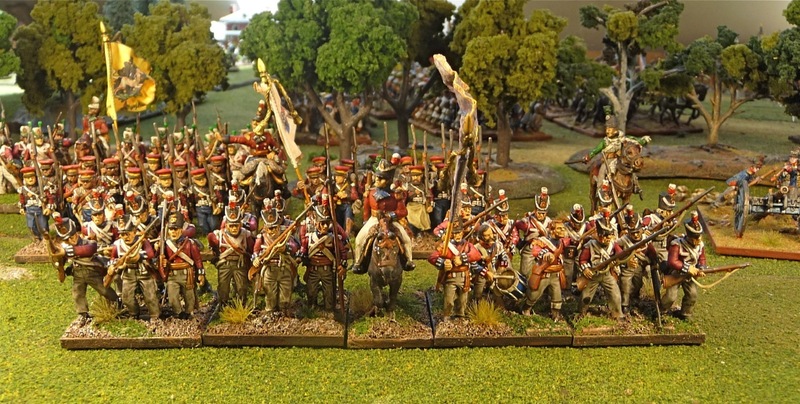 Fantastic looking figs and pics and a very interesting link to that article too! Have a great trip to Italy. A nice result John. And I can't say the idea of sticking metal heads etc on plastic bodies ever really appealed. I sincerely hope that a bunch of them don't drop off during a game! Happy holidays. I'm extremely envious. re the heads, a little more work initially but I suspect worth it in the long run, maybe pin the heads as that should add strength to the small joint. The packs should be fine as they have a large surface area to bond with. Very attractive battalion, John, and an unusual choice of subject. I do a lot of conversions, metal to metal and plastic to metal, and for heads I always pin the joint using a pin vice drill and a small length of paper clip. Same with separate arms when the strength of the fit is suspect. With practice it gets fast and easy, and saves a lot of grief later. What OdB will you use them with?